The self-diffusion of water molecules follows the Brownian motion. What is the difference between perfusion and diffusion? where D is diffusivity, also termed diffusion coefficient, has a unit of mm2/s. The higher the diffusivity, the faster they diffuse. Einstein  derived the root mean squared displacement of a self-diffusion as , where D is diffusivity, and d is also termed the diffusion distance. Once should note that diffusivity is more like a velocity measurement (distance over time) not a quantity measurement (quantity over time). High diffusivity implies faster diffusion, not necessarily a large quantity of diffusion. Assumes (1) no structural restriction (2) homogeneity in the diffusion environment. Diffusion coefficient, a.k.a diffusivity, is a velocity measurement quantifying how fast substance diffuses. Diffusion distance: the root mean squared displacement of free self-diffusion. 1. What does diffusivity measure? The effect of diffusion on the MR signal was mentioned by Hahn in 1950 . Carr and Purcell in 1954  furthered derived the mathematical framework and measured the diffusion coefficient using a Car-Purcell-Meiboom-Gill (CPMG) echo train sequence with background diffusion gradient. It can be applied to study how fast molecules (e.g. water, glycerol) diffuses by themselves, and the measurement is thus called self-diffusion coefficient. A more popular approach, the Stejskal-Tanner sequence, also known as the pulse-gradient spin echo (PGSE) sequence, was developed in 1960's to measure the diffusion coefficient (Fig. 1A). The modified version of this sequence is still used today in most of the clinical scanners. The diffusion signals (S) and diffusivity (D) have the following relation. The diffusion coefficient can thus be measured by acquiring diffusion signals with difference gradient strength |g|. 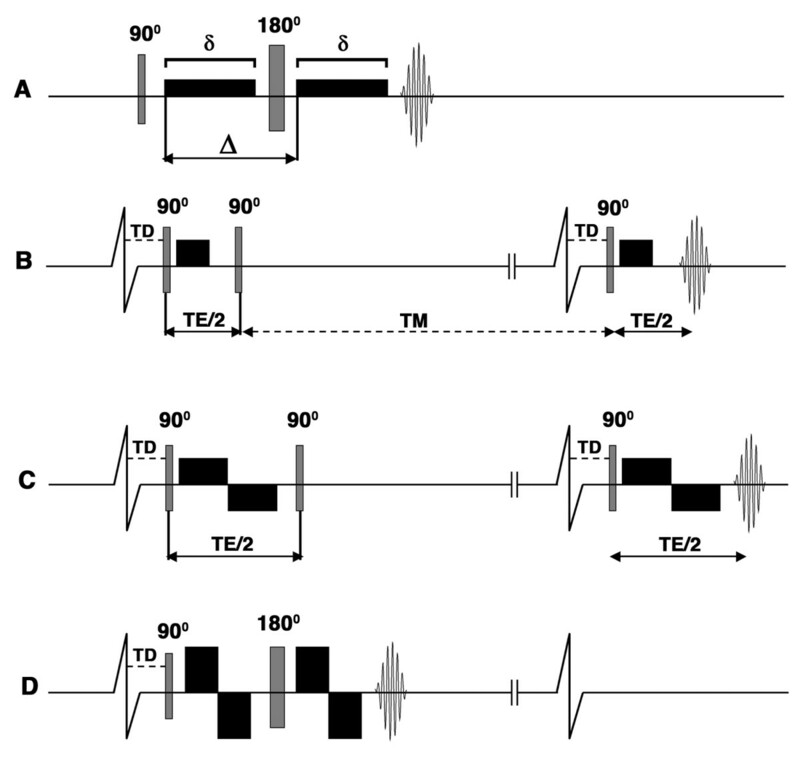 Fig.1 (A) the Stejskal-Tanner sequence (B) Diffusion-encoded stimulated echo sequence. The diffusion time (Δ) equals TE/2 plus the mixing time (TM) and is thus much longer than TE. (C) Stimulated echo sequence with bipolar diffusion-encoding gradients. Bipolar gradients lengthen the TE significantly and become limiting. (D) Stejskal-Tanner sequence with bipolar diffusion-encoding gradients. *NMR is a physical phenomenon in which atomic nuclei in a magnetic field absorb and re-emit electromagnetic radiation. The resonance frequency depends on the strength of the magnetic field and the magnetic properties of the nuclei. The self-diffusion coefficient can be measured using an NMR experiment. 1. Diffusion sequence uses gradients to encode/sensitize diffusion. 2. Diffusion is presented by an exponential signal attenuation. 3. The diffusion signal attenuation is determined by diffusion coefficient, diffusion time, and the strength/duration of the diffusion sensitization gradient. 1.What is the relation between diffusion time, diffusion encoding gradient, and the diffusion signals? 3.A study uses capillary tubes to create a diffusion phantom, and the diameter of the tube is larger than axon. How would you adjust the diffusion time and diffusion gradient strength? 4.Why does a longer diffusion time require a longer TE in the Stejskal-Tanner PGSE sequence? The combination of a diffusion sequence and k-space imaging makes diffusion MRI possible. The PGSE sequence developed in 1960s allowed for measuring the diffusivity of free water diffusion using an NMR experiment, and it was yet to be combined with MRI (Lauterbur, 1973) to spatially map the distribution of diffusion coefficient. This idea gave birth to diffusion-weighted imaging at the mid-1980's , and Michael Moseley introduced its an important role in the diagnosis of ischemic stroke . Diffusion MRI allows for spatial mapping of the diffusion signals. Due to the additional diffusion gradients, diffusion MRI often has prominent eddy current artifact, susceptibility artifact, and fat saturation artifact (note that these artifacts also exist in other types of MRI sequence). Eddy current induced by gradient switch can affects the signal readout, phase encoding, and base b0 . The solutions are (1) correcting the partial distortion by a linear transformation, (2) using a bipolar pulse to for diffusion encoding (Fig. 1D). Susceptibility artifact is presented by in-plane distortion and through-plane signal loss. Diffusion gradient encoding increases echo time and result in greater susceptibility artifact. A longer diffusion time also increases echo time. To reduce the artifact: (1) Using a stronger gradient coil to reduce encoding duration. (2) Use a stimulated echo sequence that allows for long diffusion time and short TE. (But SNR is reduced by half in stimulated echo). The artifact can be corrected using FSL TOPUP with two phase encoding acquisitions. Fat saturation artifact becomes prominent as b-value increases. Fat signals can be greatly reduced using fat suppression. However, diffusion MRI relies on signal attenuation (high b-value, low signal) to quantify diffusion coefficient, but fat does not diffuse. As a result, in high b-value images, signals from water are gone while the fat signals remain. Consequently, it causes errors in diffusion analysis. The solutions are (1) adjust FOV to avoid wrapped around of the fat saturation (not practical for high-resolution imaging), (2) use a better fat saturation sequence. The figure shows the fat saturation artifact in b0 (b) and FA map (c). source: Yeh, P. H., Oakes, T. R., & Riedy, G. (2012). Diffusion tensor imaging and its application to traumatic brain injury: basic principles and recent advances. Eddy works for single-based diffusion data and does NOT work for non-shell based data (e.g. DSI grid data). 1. Diffusion MRI usually suffers from the susceptibility artifact, fat saturation artifact, and eddy current artifact. 2. The eddy current artifact can be corrected using a software tool (provided that the SNR is good enough) or a set of specially designed diffusion gradients. 1. What is the relation between diffusion gradient strength, diffusion time, and eddy current artifact, susceptibility artifact, fat saturation artifact in diffusion MRI? 2. How to correct for Eddy current distortion? Is there any limitation? 3. How to correct for susceptibility artifact? Is there any limitation? 1. Load an example diffusion MRI data set at https://pitt.box.com/v/course-artifact . Create an SRC in DSI Studio and open it in STEP2 Reconstruction to see the raw DWI. 2. Point out where eddy current distortion, susceptibility artifact, fat saturation artifact are. 3. Compare the b0 with one DWI. Which regions brighten up? Why? 4. Use DSI Studio to do a quality control assessment on DWI data. E L Hahn (1950). Spin echoes. Physical Review, 80:580–594. Jezzard, P., Barnett, A. S., & Pierpaoli, C. (1998). Characterization of and correction for eddy current artifacts in echo planar diffusion imaging. Magnetic resonance in medicine, 39(5), 801-812.